Despite being aware of it for ages and talking about it all week, it was only last night when I started recording the Arsecast that it really hit me that the FA Cup final is tomorrow (it wasn’t tomorrow then but for all intents and purposes it was because I was talking as it was). The FA Cup is a competition with amazing history. Today we watched a video about Arsenal’s previous wins and thanks to the clips I trained with even more motivation. I hope we can win the cup so the Arsenal supporters are happy. Even more motivation? That’s like somebody actually, literally, giving 110%. And although many of the squad from last year’s FA Cup win are involved this time around, I’m glad they watched a video to remind them how important this is. I don’t think there’s a need to avoid complacency, we know from our last visits to Wembley that the perceived quality of the opposition doesn’t matter, we’re going to have to be switched on against a Villa side that will be underdogs and will thrive on that. But anyway, an even more motivated Alexis Sanchez is really something to consider. And that kind of drive is what’s going to play a part in bringing this club and this team forward in the future. Like it or not, and for many people it’s not, we’ve come through a make-do and mend era. Was there that kind of win-at-all-costs attitude from players in the past? Not particularly, and the ones who did have a burning desire to win things went elsewhere to do it because they didn’t see it happening for them at Arsenal. The reason why I moved to Arsenal is because there were a group of young players with the ambition to achieve things. I thought that Arsenal was the perfect club for me, the perfect club to win titles and compete in every competition. And that’s what we have to do because if we don’t players with that outlook won’t hang around, they’ll go where they can compete. However, hopefully what he brings to proceedings in terms of his quality and his attitude rubs off on those around him. He’s a great example to all our players, young and not, and where he leads others should follow. Meanwhile, as the goalkeeping saga continues, Bob Wilson reckons it’ll be Wojciech Szczesny in goal. I’m still not sure what the manager is going to do, my opinion varies, but the former double winner and goalkeeping coach thinks the manager will stay with Szczesny despite him not playing in the final league game as a warm-up (which is the thing that makes me wonder if he’ll go with Ospina). Anyway, it’s purely unscientific I realise, but a poll at the bottom of that post suggests that 66.58% would like to see the Pole in goal, with 33.42% preferring Ospina. Of course what fans want and what Arsene Wenger are often two very different things, but we don’t have long to wait now to find out. Right then, time for the Arsecast and on this week’s show I’m joined by The Man from East Lower, Goonerholic and Andrew Allen for a round-table pod to discuss the goings-on at FIFA, the end of the Premier League season and whether progress has been made and, of course, the upcoming FA Cup final and all that that entails. Will it be Ospina or Szczesny? Giroud or Walcott? We go over all that and there’s the usual waffle besides. 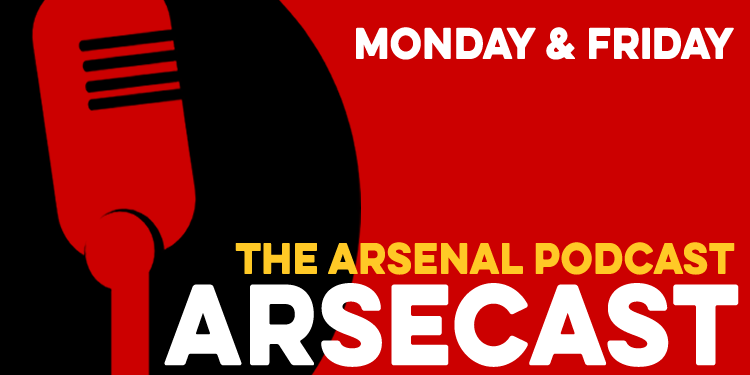 To download this week’s Arsecast directly click here – 40mb MP3. The Arsecast is also available on our SoundCloud channel, as well as via the SoundCloud app for iPhone and Android. You can now also find it on the Stitcher podcasting app for iOS and Android. Or, you can listen without leaving this page by using the player below. Ok, that’s about that for now. All going well, James and I will be in The Tollington later but my podcasting partner had a rather Arsenal player experience on the Emirates pitch yesterday – fingers crossed he’ll be ok though. We’re hoping to kick off stuff around 7pm and assuming it all goes to plan it’ll be broadcast live here on Arseblog – check back later for a post with all the details or follow @arseblog on Twitter for updates (and possible pleas for help). Now, I’d better pack a bag, have a bite to eat and head to airport. Looking forward to seeing some of you later on and over the course of the weekend.